AB-64_Transmitter The North Vietnamese set that was shown was listed as being of 1963 vintage but I question the accuracy of the CIA's dates. The set was probably captured in 1963. Looking at a 4th generation photocopy does not provide much detail but the set appeared to be two sets, probably a receiver and a transmitter. 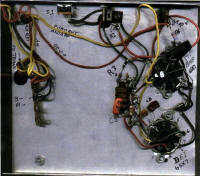 The parts were mounted on a front panel or a chassis panel which was attached to the front panel. The "chassis" had no side panels for strength. Guessing at the size, based on the components the sets were probably 12 inches wide and 6 inches high. The "chassis" portion was probably about 4 inches deep. Both sets were mounted in a metal chest, much like some of the WW II Japanese sets. The one set that was removed from the case looked much like the Japanese TM Handy Wireless set which slid in and out of a case. While the Japanese set was a Bakelite panel attached to a wooden base, this set was made of metal. 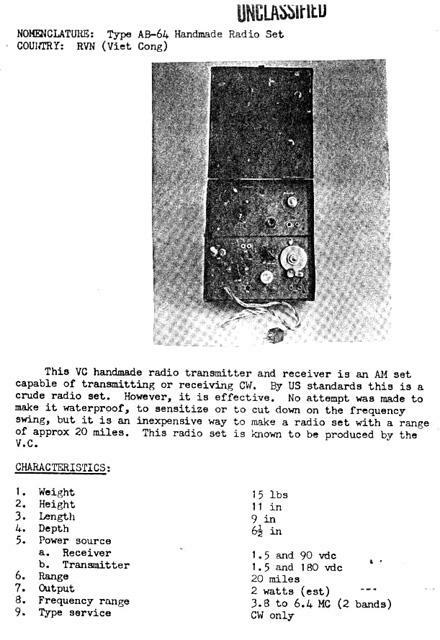 AB-64 Receiver Underside Further research showed the same radio in the 1967 Technical Intelligence Bulletin, published by the Combined Material Exploitation Centre in Vietnam. It was designated the AB 64 set. Where this designation came from is unknown. It was supposed to have a range of 20 miles and used 1.5 volt filament tubes and B+ voltages of 90 and 150. I decided that this was another candidate for a reproduction set. My concession to practicality was to use 6 volt filament tubes. I had a local metal shop produce a case for the two sets and then made two chassis which could be placed in the outer case. Since the original set is long gone to somewhere, I did not have any schematics nor a clear picture of the controls. 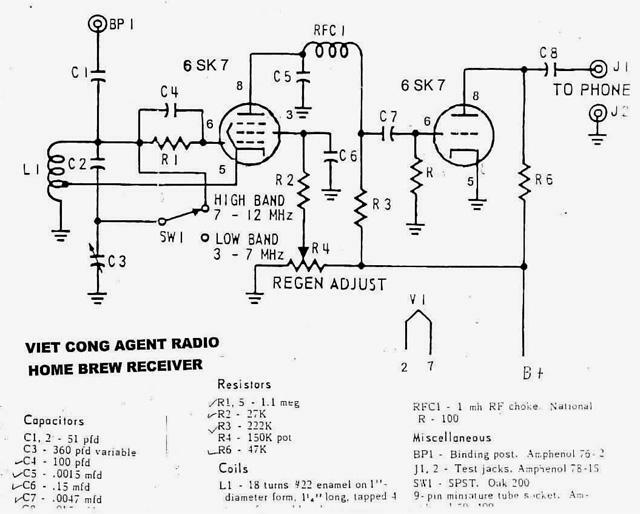 The transmitter was the simple 6L6 circuit common among home brew transmitters of the 1940s and 1950s. 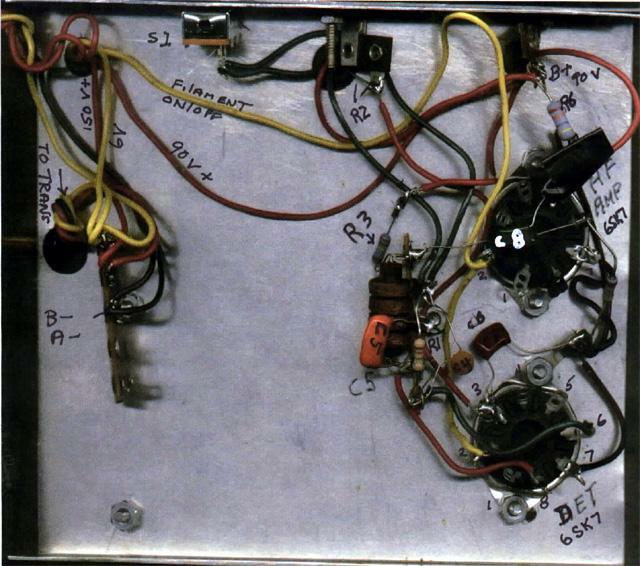 I did however use a 6V6 tube which has the same pin configuration and was also used in the Para set of WW II. 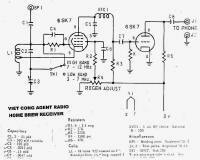 I have been told that the Para set used the 6V6 tube as it was common in broadcast radios of the 1930s and 40s and could easily be found by "robbing" a broadcast set. AB-64 T.I.B. The receiver was much more of a challenge. It had the power cables and other controls. Looking at the pictures, it seemed to have more dials and switches that was needed. I used a DPDT toggle switch to divert B+ from transmitter to receiver. One pole handled 90 volts and the other pole handled the150 volts for the transmitter. Since both transmitter and receiver had additional toggle switches, I used them for controlling filament supply. 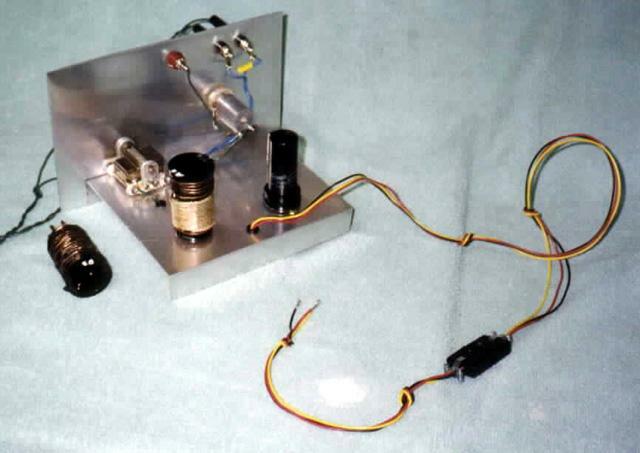 I also had constructed a small receiver based on a 6LN8 tube which covered 2 -12 Mhz. It used a switch to change the freq range. For this switch I used a SPST slide switch and there were two on the front panel. 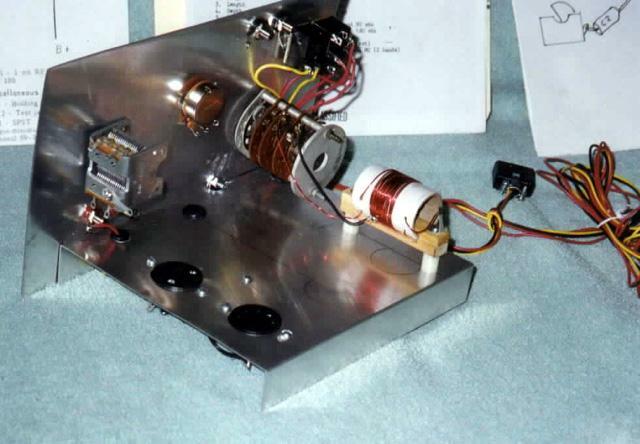 A standard 365mmfd capacitor was the main tuning capacitor. I located a four position rotary switch which I decided would work for a band switch. 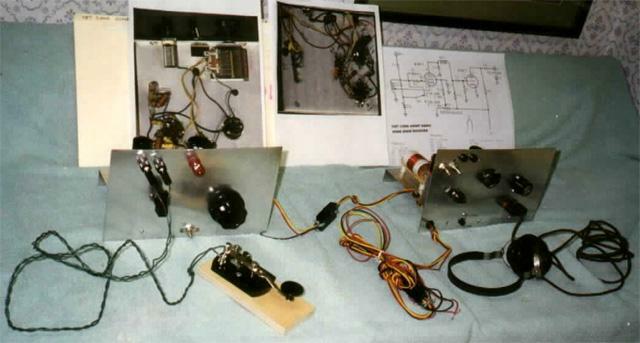 The plan was to used different coils mounted to the chassis and then switch between the coils. The first coil was wound and mounted and the set was tested. It was dead as a door nail. Several attempts were made to get it working and I finally located Pete McCollum who agreed to try to get it working. I shipped the set out to him and he went to work. After a few changes to the circuit, he managed to get it going.